Join the discussion on the events of the day. It is your chance to listen and be heard. 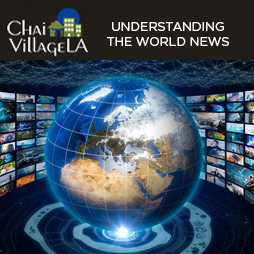 This discussion group focuses on the news of the week. Participants share articles and diverse opinions that pertain to what's happening both in the United States and Internationally. Many of the "pundits" we analyze write for the New York Times, the Wall Street Journal, the Washington Post and the Los Angeles Times. Other sources include magazines such as The New Yorker, The Atlantic, The New Republic as well as other journals that give in-depth coverage of current topics. The class is taught by ChaiVillageLA member, Myrna Hant. Myrna received her Ph.D. in Higher Education from UCLA. She was a college administrator as well as an instructor in Women's Studies at Chapman University. ChaiVillageLA members, as well as other Temple Isaiah and Temple Emanuel adult congregants, are welcome.